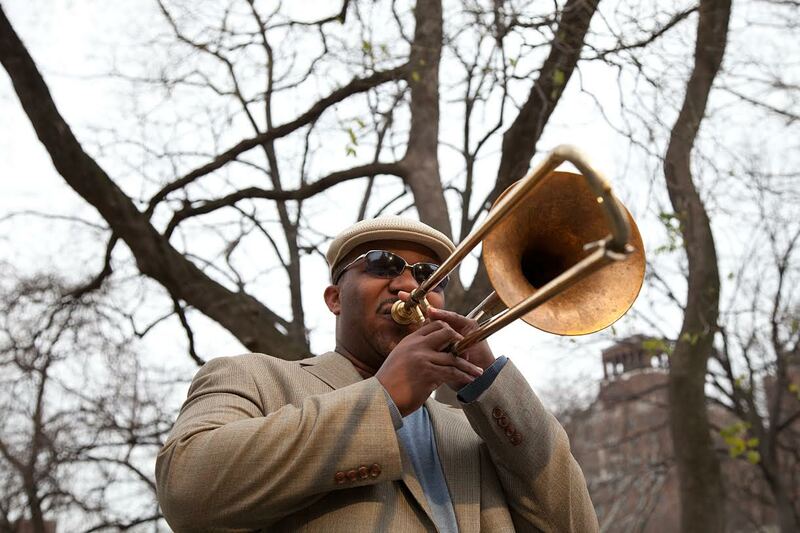 Marcus Lewis has become one of the most in-demand trombonists in the Atlanta area. Lewis is a musician who creates jazz/improvised music with integrity and passion that resonates. Described as soulful, fiery and intuitive, Lewis focuses on the musical journey and conversational aspects of the jazz/improvised music genre. Marcus Lewis was born in Augusta Georgia in 1978. 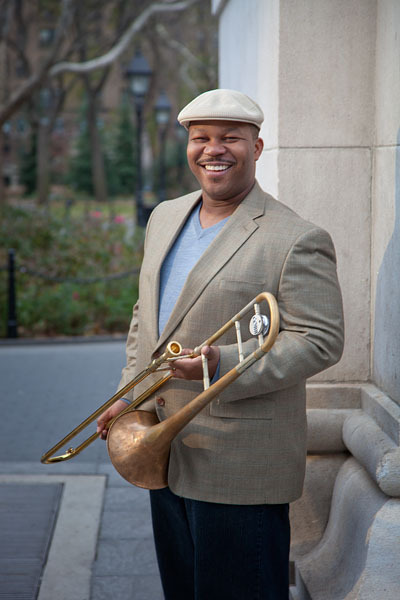 In 2001, Marcus graduated from Valdosta State University with a Bachelorʼs Degree in Jazz Performance and continued on to receive a Masterʼs Degree in Trombone Performance from the University of Nebraska at Omaha. He lists among his notable performances the Birthday of St. Petersburg Russia in 2001,the Klipieda Jazz Festival in 2003, and the Jimmy Carter Summer Concert Series in 2008. As a member of Janelle Monáe’s ArchOrchestra, Marcus Lewis performed at the 53rd Annual Grammy Awards, the 2011 Glastonbury Festival, the 2011 Nobel Peace Prize Concert and the 2010 North Sea Jazz Festival. Marcus has also played at the 2010 New Orleans Jazz Fest while touring with the Ohio Players. Marcus was awarded the 2008 Betty Carter Jazz Residency and Outstanding Soloist at the Wichita Jazz Festival in 2003. I met Marcus through our son, Chase many years ago. I’ve had the pleasure of playing with and for him several times, and admire his work ethic and his great sound. Each time I’ve hit a bandstand with him it’s been memorable, he makes every tune count. We’ve hung out in clubs from the midwest to New York City. Everyone who knows Marcus Lewis is proud to call him a friend. He’s just that type of person. I caught him on the road, as usual, for his FIVE QUESTIONS. 1) You are well known for running a tight ship, regarding keeping the business end of music going. You are on time, positive attitude, practiced, ready to roll, promote the gigs. Can you speak to how you became such a great professional musician? Do you expect that of the cats you play with? Do they ever let you down? ML – To be honest, it’s a lot of trial and error. Being a trombone player, you can’t sit around and wait for your phone to ring. You have to be proactive in getting your own gigs. I came up with a system of getting gigs, rehearsing a band, and building repertoire. Also, when dealing with jazz or smaller clubs, the majority of them don’t promote bands, so they expect musicians to do it. (that’s a whole different topic…) So if I want my music to get out there I have to be creative in promoting it. Whenever I do get called for a gig, I learn the material, show up on time, and have fun. You’d be surprised how many cats get gigs by just being reliable, knowing the music , and having a great attitude. I expect that as well for the musicians I hire and play with. In any business, they are people who let you down, and the same applies to musicians. 2) Talk about the Janelle Monáe scene? How’d the association come about? How is it to make a living with a band that’s not your own, but still strive and write for your own band? Have you been having a ball travelling with her? (She seems like quite the professional too..yes?) Any super-memorable gigs? 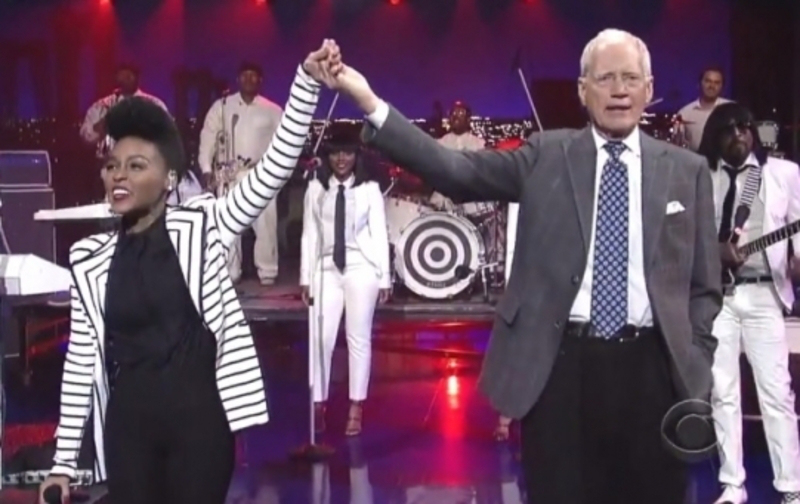 ML – The Janelle Monáe gig is great! The association came about though mutual friends, Dwayne Dugger and James King. (who now plays sax and trumpet for Bruno Mars) They played in a band called the Jaspects with Janelle’s MD, Terrence Brown. I auditioned and they picked me. It’s awesome to make a living playing music! While on the road, I make myself find the time to write and arrange. I need to get better at coordinating the Janelle gig with my own shows. I have had the time of my life on the road with Janelle. We have literally travelled all over the world to play music! I like experiencing other cultures and meeting new people. The thing that I admire most about Janelle is the amount of focus she has. I hope that I can reach that level of focus someday. I think I have too many super-memorable gigs to mention, but I’ll list my top five in no particular order…..
3) What are your practice habits? How do you manage it on the road? ML – I have spells of intense practice at this point in my life. When I am home my practice habits are great, but on the road not so much. It is hard to find the time or space to practice and when you do, there is always some who wants talk or some kind of distraction lurking around the corner. When I first started touring, there were days where I’d be lucky to get a warm-up in. Now, because I manage my time a little bit better, I get at least an hour of maintenance practice while on the road. 4) What music are you listening to now? What is inspiring you to create right now? What is the direction your music is going in? ML – I am listening to all kinds of music right now! I find a lot of inspiration in the human experience. I’d like to think that my music pays homage to the past but is relevant and based in the now! I think we are all connected. If it resonates with me, it will resonate with you! Also, I don’t know if she knows it but I get a TON of inspiration from my wife Andrea. I get inspiration from the music that I listen to. I do go into these intense periods of study/listening to the same things over and over to soak it up. I am listening to a lot of music from friends/peers that I play with, which in turn inspires me as well. Anything with Trombone Players Elliot Mason, Isaac Smith, Mike Dease, Stafford Hunter, Vince Gardner, Andre Heyward, Steve Davis and Dave Gibson on it. I feel like my music will go in the direction of my life’s journey. There will always be happiness, pain, joy, love, and laughter. I want to create music on the level of a Wayne Shorter, Stevie Wonder, Michael Jackson, or John Coltrane, so it will be timeless. 5) You have associations with musicians all over the world now, and can take your charts anywhere and set up gigs to play. What’s the future look like for you with your own music? With Janelle Monáe ? Goals short-term/long term? ML – In life we always have to find balance. That is by far the hardest thing. Ultimately, I want to tour the world playing my music, doesn’t everyone? I think the future looks bright on both sides of my musical coin. I see my self short-term playing with Janelle and doing my own music. In the long term, I want to continue play with Janelle and get better at managing my time to do more of my own music. I want to really concentrate on getting better and build a strong fan base. The Marcus Lewis Band will be Approaching Gangsterdom. That simply means in the long term, we will be taking over your city!